This Reader's Theater was written for a small group of 4 students. 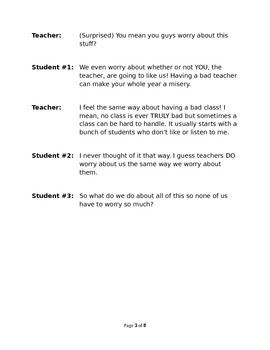 It is about the first day of school and addresses issues like why we have rules, the fact that teachers can be worried to, and what might make a good class rule. 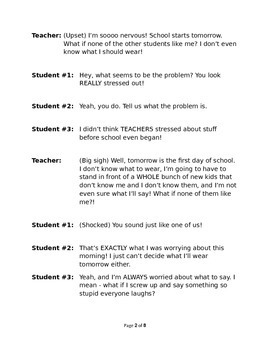 When they are finished discussing things everyone feels better about that first day of school. 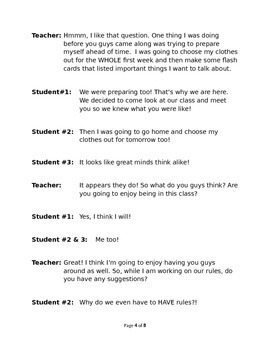 This is a fun way to introduce a discussion on what rules a class should have. I have my students create them with me each year. The reason this script is slightly cheaper than others is because it is not yet rated. I write small group reader's theaters so they will work better in centers and to avoid having long wait times between student's lines. Wait time is not reading time and often turns into off task behavior time. Small group reader's theater helps to get students reading more and encourages even reluctant readers to practice fluency. My name is Melanie Whitesides but my store name is Wonbyone and I hope that your students enjoy this script as much as mine did. Most of my scripts are black and white so that they can be photo copied easier for your students. Please let me know what you think. 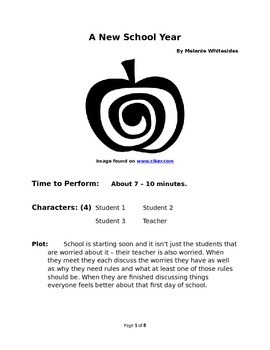 A New School Year - Small Group Reader's Theater by Melanie Whitesides is licensed under a Creative Commons Attribution-NonCommercial-NoDerivatives 4.0 International License.